Before going to see Logan this weekend, I had expected a few items - like the film having a bit of a Western flavor and a jump in time. Nothing too surprising there, as I knew James Mangold was especially good in utilizing the Old West theme. His under-appreciated 2007 remake of 3:10 to Yuma was a movie I liked. 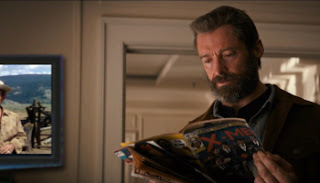 Mangold had also directed Wolverine (2013), so he probably had a good fix on the timeline he wanted to explore in Logan. It was an excellent movie. An intellectual film that uses words, violence, and feelings in ways that will surprise you. But you don't need me nor Rotten Tomatoes to tell you that. What I was not anticipating was how my recent synchromystic awareness of "corn" popped up in Logan (2017), at least three times. 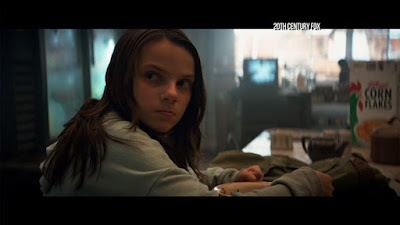 The character Laura (X-23) was born in our world as Daphne Keen Fernández, in 2005. She is the daughter of British actor Will Keen, and Spanish actress, theatre director and writer María Fernández Ache. Will Keen was born in Oxford, Oxfordshire, the son of Charles William Lyle Keen and Lady Priscilla Mary Rose Curzon, daughter of Edward Curzon, 6th Earl Howe. The Earl, thus, would be Daphne's paternal great-grandfather. It stuck me like lightning. 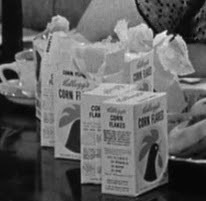 There she was, relatively early in the movie, eating corn flakes. 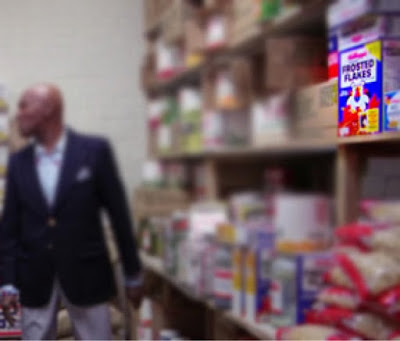 Some have noticed this shot of Kellogg's Corn Flakes, citing it as an example of product placement. I think it is more than that. 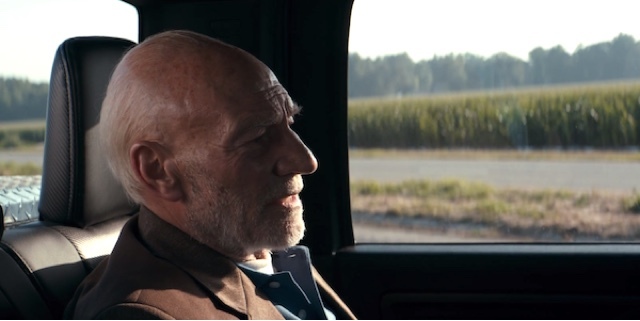 Next, the trip to the supposed safety point for Laura leads Wolverine (Hugh Jackman) and Professor X (Patrick Stewart), with their young ward, along roads showing the cornfields of the West/Midwest. Cornfields. And more cornfields. But is it a journey to Heaven or Hell? Logan directly synced for me with Sam Mendes' 2002 film, Road to Perdition. Perdition: a state of eternal punishment and damnation into which a sinful and unpenitent person passes after death. A hitman (Michael Sullivan, played by Tom Hanks). 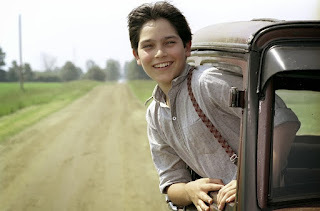 His innocent son (Michael Jr., played by Tyler Hoechlin - btw, born on 9/11/57). And a road to hell (Perdition) lined by cornfields. Redemption or perdition? Or even Elysian Fields (full of corn)? On a deeper level Michael Sullivan thinks he will find sanctuary on the lake shore in the fictional town of Perdition, Michigan. Instead, another future dwells there. John Rooney [the gangster boss, played by Paul Newman]: There are only murderers in this room! Michael! Open your eyes! This is the life we chose, the life we lead. And there is only one guarantee: none of us will see heaven. John Rooney: Then do everything that you can to see that that happens. Logan is on the same journey. These cornfields signal the way. But in Logan, the cornfields are said to be full of enhanced GMO corn, where the crops are grown not to eat any longer. In the future, only the corn syrup is added to drinks, because people are addicted to the byproduct. After all, Logan is set in 2029. Other films set in 2029 include the Japanese version of Ghost in the Shell (1995), a remake of Planet of the Apes (2001), and a trilogy of Terminator films (The Terminator, 1984; Terminator 2: Judgment Day, 1991; and Terminator Genisys, 2015). Logan's world is more realistic, like ours, thanks to Mangold, than some of the other "2029" films. The corn was evolving. Compared to Blade Runner, for example, set in 2019, Logan's 2029 is almost as unevolved as Shane's. Logan's producers told local media they picked Ferriday, Louisiana, specifically because the movie needed "a beautiful country setting with corn." 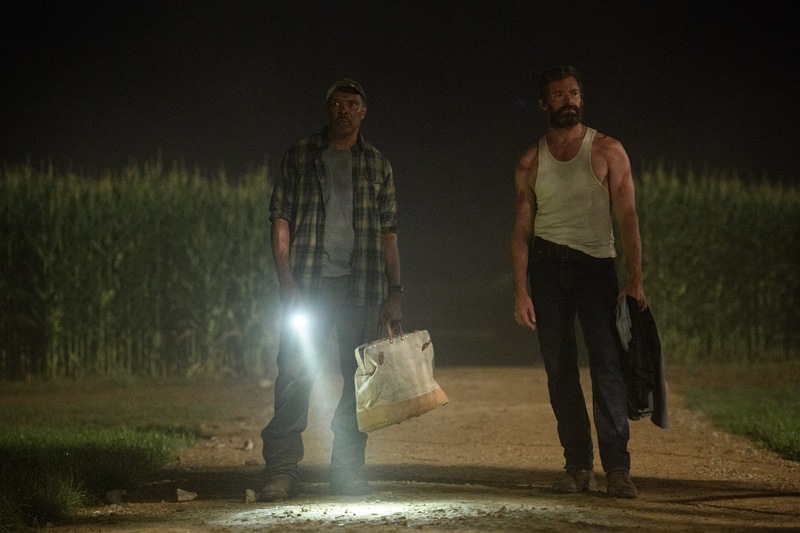 Farmer Will Munson (played by Eriq La Salle) takes Logan through some cornfields during part of his trip to his and Laura’s future. Violence is always around that next cornstalk. It is Shane where the story comes home in Logan. The merge is complete in the final scene. 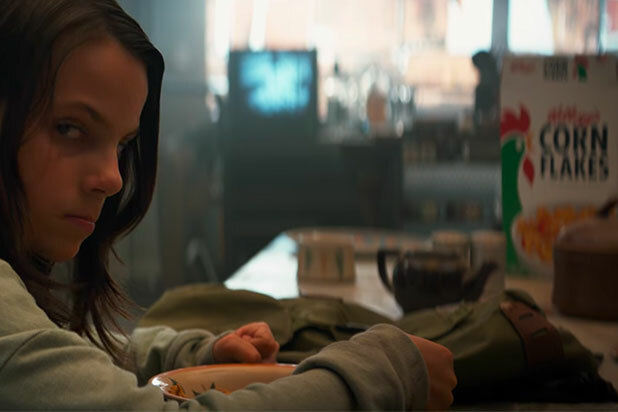 At the end of Logan, Laura gives a reflective look back (and forward?) that is straight from George Stevens’s 1953 Western, Shane. 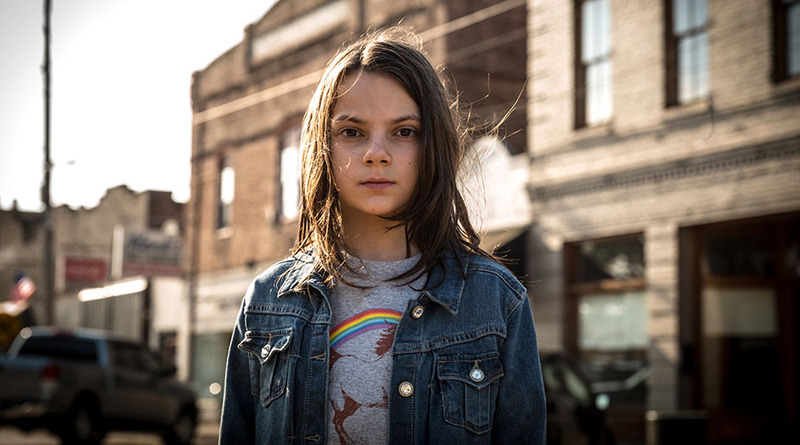 She memorized a monologue directly from Shane, which Laura, Logan, and Professor X had watched earlier in an Oklahoma hotel, during their journey. It summarizes much about the core of Logan. There’s no living with a killing. There’s no going back from it. Right or wrong, it’s a brand, a brand that sticks. There’s no going back. Now, you run on home to your mother and tell her, tell her everything’s alright, and there aren’t any more guns in the valley. It seems only right that James Mangold would end on this note. Logan's use of Shane, it turns out, has a very personal sync for me. I was in Hollywood shooting an interview for a feature documentary when a movie director friend, Peyton Reed (Ant-Man and the Wasp, 2018; Ant-Man, 2015; Yes Man, 2008; Back to the Future, tv series, 1991; Through the Eyes of Forrest Gump, tv documentary, 1994; The Secrets of the Back to the Future Trilogy, tv documentary, 1990) called me out of the blue. He invited me to a special showing down the road from the hotel where I was staying. 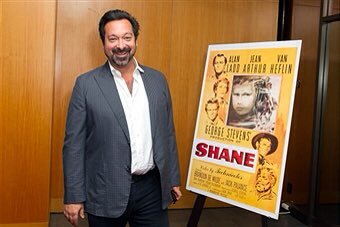 On October 7, 2013, at the Academy of Motion Picture Arts and Sciences' Samuel Goldwyn Theater in Beverly Hills, I got to attend a special screening of a newly remastered version of Shane, which was being shown there. The introduction was by director James Mangold. The following is his complete talk on Shane. I am here to introduce one of the most inspiring Hollywood films ever made. A film so resonant that it is always in my consciousness as I make films, yes – but also as I live and struggle with the choices in everyday life. I will try not to spoil it for those of you watching for the first time but I want to speak for a few minutes about this film’s monumental achievements. There are so many elements worthy of discussion. Firstly, the brilliant direction. 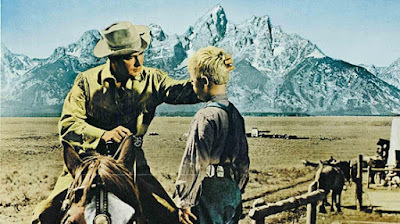 George Stevens’ body of work is legendary and diverse. Films as varied and wonderful as Gunga Din, Talk of the Town, A Place in the Sun, Woman of the Year, Shane and Giant all exist in his resume. Such versatility has fallen out of fashion in Hollywood and as someone who aspires to the range of Mr. Stevens, his artistry is a particular inspiration to me. Versatility can be a liability in Hollywood as it is much more fashionable to brand yourself as a master of one genre or another. But that denies a filmmaker the lessons each genre can teach us about the other. In Shane we see Stevens at the height of his powers and also unafraid to play with action, epic visuals, humour, stylization, sentiment, intimacy and love – many genre-contradictory elements – all utilized in the same film. He was nominated for Best Picture and Best Director for his work on Shane. The idea of the Western is more than horses and hats and gunfights. The film is also a powerful, bold and poetic example of the art of screenwriting. Tribute must be paid to A.B. Guthrie Jr. who was nominated for an Oscar for his great work. Let’s remember Guthrie not only wrote what people in this film say, but more importantly, what they don't say. Shane was magnificently photographed in dazzling Technicolor by Loyal Griggs who won an Oscar for his efforts. I think tonight, with thanks to all who worked on the films restoration, you will see why. The film also features an ensemble of actors performing roles that will come of define their careers. Alan Ladd as Shane, Van Heflin as Homesteader Joe Starett, Jean Arthur as Joe's wife, Marian. 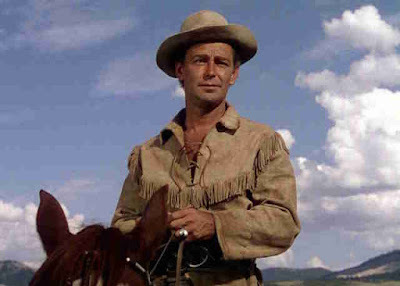 Arthur's performance is critical to the film's depth and sophistication, walking a fine line portraying not only the ideal of a loyal homesteader's wife but also a flesh and blood woman with desires and dreams of her own, and whose admiration for Shane is not judged by the film or even by her husband but just allowed to be. 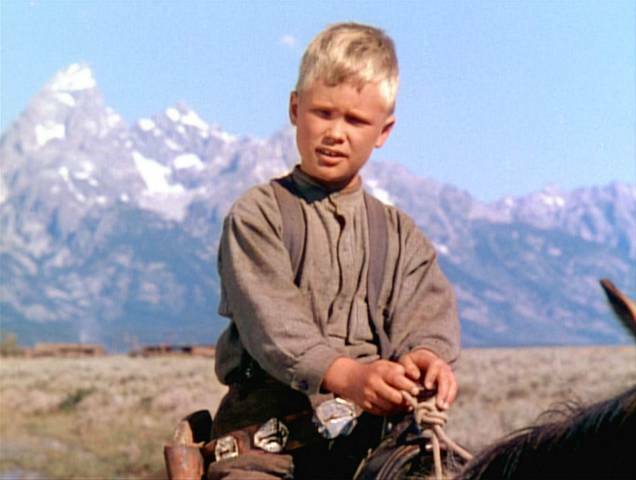 No mention of the cast can be complete without recognition of the magnificent contributions of Jack Palance, Elsiha Cook Jr, Ben Johnson and, of course, the miraculous performance of Brandon DeWilde as young Joey. Joey's wide eyes are the prism through which we experience the entire film. The story begins (and famously ends) with him taking in the arrival and departure of the title character. I am always reminded, through Joey and this film, of one of the most bittersweet facts. That the course of our lives can be profoundly changed by folks who sometimes cannot stay. The temporary nature of some relationships in our lives does not diminish their power and in fact sometimes enlarges them. We also feel through Joey, that moving moment when a child first becomes aware of the darker complicated shadows and mysteries that await them in adulthood. I’d also draw your attention to a simple observation. While the film is beautifully staged and photographed, it is relatively light on Hollywood glamour. Everyone, principals and extras, looks their age and real. Clothes are worn and the land is real. Starting with young Joey and his hacksaw haircut nearly crossed eyes and moving through the rest of the cast, there is a daring naturalism and humility. To me, as someone who has made a Western and hopes to make more of them, the idea of the Western is more than horses and hats and gunfights. It grieves me when the Western is reduced in conversations I overhear to a cinematic trip to Knotts Berry Farm. Shane is a fever dream of American aspirations, values and character. No. 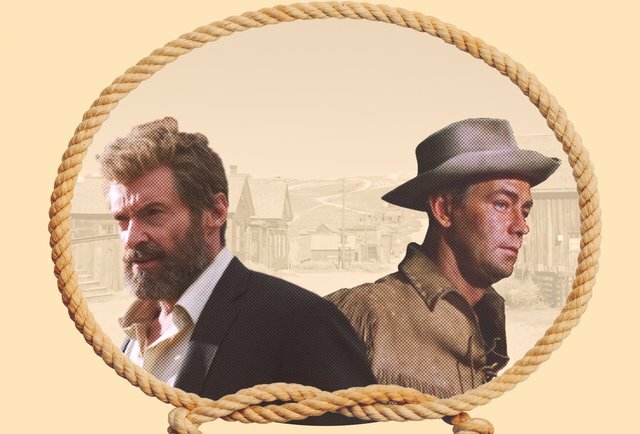 The best Western films (and this is an example of the very best) are not centered on nostalgia, are not historical in nature (the moment in history when these films took place is largely a manufacture of imagination). The best of these films create a landscape that has evolved into an American mythology, one as resonant and evocative as Religious parables, Japanese Samurai tales and the Greek Gods of Olympus. The moment I first looked past the quaint artefacts of Western life, the sagebrush, the hats, the breakaway chairs and "varmint" talk -- and saw the genre as parable, was the moment films like Shane became transcendent to me. In great Westerns like this, you will find a story that relates as profoundly to current times and troubles as it does to the past. Shane is a fever dream of American aspirations, values and character, conflicts with right and wrong, our ongoing struggle with the contradictory goals of freedom and law, self-reliance and big business-- and definitions and explorations of heroism, courage and family responsibility all observed and made even more penetrating when they are brought to life in an environment without cars, phones and the ability to dial 911 whenever you feel nervous. The great grey Tetons that fence in the characters of Shane both contract the scope of the film (it will all happen in this valley) and at the same time explode the scope of the themes make the film feel huge. The mountains also define the nature of the characters’ isolation. It will be up to these folks to solve their problems. They are on their own. Because some of you are seeing this film for the first time, I hesitate to over quote scenes you are about to watch. 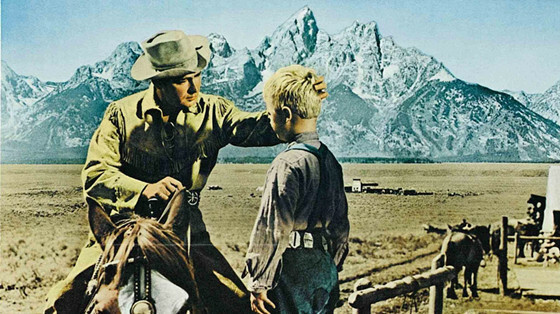 But I do want to bring up one moment-- a moment that defines my admiration for the film and my own sense that no matter how large the themes, there was no small gesture of intimacy missed by the watchful George Stevens. 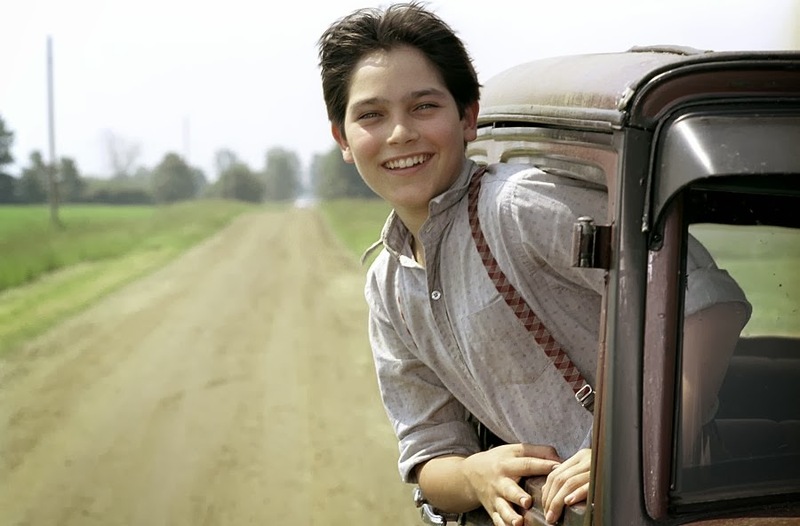 An hour and twenty minutes in, Joey, our young hero, is attending a funeral for a homesteader who has been murdered – and while the scene contains the requisite sombre and beautiful staging that define this genre, there is a fleeting moment that runs counter to this tone. You will find a story that relates as profoundly to current times and troubles as it does to the past. As the homesteaders lower the casket of the murdered man into the dirt, a distracted Joey, perhaps looking to escape the adult world of tears and grief, wanders over to a light brown foal nursing on its mother tied to a post. As Joey reaches out to the foal and a lone harmonica plays for the dead man, and we cut to shockingly tight close up of a little girl, presumably a daughter of the murdered man. She blurts out "He's gonna bite you! It’s gonna bite you!" But Joey touches the foal anyway and it does not bite him, though it bares its teeth. And the little girl grins and laughs. The moment is over as soon as it begins and may seem slight to you. But to me it is a fleeting illustration of this film's attention to detail and even more so to its courage to do the unpredictable. It feels like a stolen moment of some real life magic happening on set – but within it, the whole enterprise of the film is revealed. We are watching an exploration of absolute innocence and absolute darkness at the very same time. Thank you for listening to my ramblings. Please sit back and enjoy the film, but like the little girl, I will warn you now. It may be a golden age film. It may be sixty years old. But it’s gonna bite you. In fact, I hope it does. ~ James Mangold. Watch, with spoilers, 19 Easter Eggs in Logan. Did you ever see the 1961 episode of "The Twilight Zone" called "A Hundred Yards Over the Rim?" Very interesting episode. Actor Cliff Robertson plays pioneer Chris Horn (C-orn) in 1847 New Mexico Territory (sync Roswell, but 100 years earlier). He and his family are running out of food and water and their son Christian is deathly ill. Chris goes out to look for help and somehow goes through a "portal" (presumably) into present-day (1961) New Mexico. It's a great episode, if you haven't seen it. Anyway, that same actor, Cliff Robertson (married to Post Cereals heiress Dina Merrill for many years) also played JFK in "PT-109" (released in 1963 - 5 mos before Kennedy's assassination - Kennedy personally chose Robertson to play him in the film) and he would also play the role of Buzz Aldrin in 1976's "Return to Earth." Most interestingly, in light of this post, is that Robertson also played a villain in the 1960's "Batman" TV series, a character known as "Shame," a play on "Shane." Robertson's wife, Dina Merrill, played "Calamity Jan."
Robertson also played Peter Parker's Uncle Ben in the 2002 "Spider-Man" film, where the Twin Towers are erased from the film, following the 9/11 attacks.